Jamshedpur FC’s campaign in the 2018-19 Indian Super League season will now feature only one more match after they could only muster a 0-0 stalemate against Chennaiyin FC on Saturday night. The men from the Steel City went into yesterday’s clash knowing that only a win would do with NorthEast United occupying the final qualification spot five points ahead of them. And after a largely lackluster affair, Jamshedpur couldn’t quite get that win that they were desperately looking for, a late goal from substitute Michael Soosairaj chalked off, correctly at that, for an offside infringement. Jamshedpur now just one last bit of business left, to complete their final league game against Bengaluru FC. Cesar Ferrando, coach of Jamshedpur, wasn’t willing to go over what went wrong for them this season in the immediate aftermath of their elimination from the playoff race. 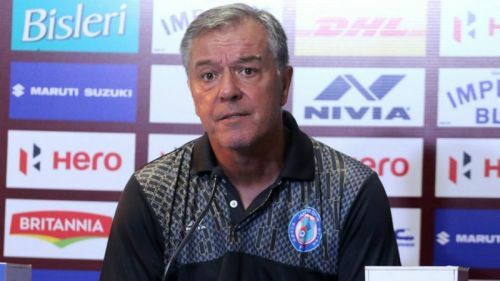 Jamshedpur have faced injuries to many of their players this season, something that Ferrando touched on again in the post-match press conference. As a result, he had to make do with an eleven that featured no out-and-out striker. “Team can counter-attack. We wanted to make sure the match was alive going into the last 15 minutes. I think we did very well”, said Ferrando who added that he felt his side had done enough to get a win. Despite that assertion, Ferrando hardly seemed happy with his players. In the opening half hour of the match, the Jamshedpur could be heard voicing his displeasure and engaged in animated conversation with a number of his players. There was one moment of contention though with replays showing that Jamshedpur clearly had a case to feel hard done by. In the 5th minute of the second half, a free kick just outside the box taken by Carlos Calvo hit Isaac Vanmalsawma inside the box while he was jumping up to block it with the Chennaiyin midfielder’s hands up in front of him in an unnatural position. The Jamshedpur coach also bemoaned the lack of options to reinforce his squad when asked about the composition of his side. "When I come I believe that all teams in ISL operate with same budget. That we have to stick to it. So Tim Cahill, our foreign player injured, and we cannot sign any new player because of budget. But I can see other teams signing players, cheaper players, also more Indian players. For me this is very interesting", said Ferrando unhappy with the way that other teams have been able to bolster their squads. Jamshedpur round off their season with their final game against Bengaluru FC on Wednesday, 27th February.